Kirkwood Trading Company provides custom tshirt printing in Saint Louis Missouri. As one of the oldest companies providing custom t-shirts these guys understand customer service and quality. They carry all the major brands and styles and offer a few different printing techniques from screen printing to dye sublimation to photo printing through half tones. One unique aspect about Kirkwood Trading Company is there impeccable customer service. They take the time to know their clients and understand their clients needs and the purpose of their custom t-shirts. Custom t-shirts are a marketing tool and it doesn’t matter if it’s for a business, a function, or a fraternity, the message gets seen. Custom tshirt printing is a fun business and it’s always something different each and every day which makes for a very fun business. In regards to orders Kirkwood Trading Company is in a unique niche in that they’ll print orders as small as 12 shirts and orders as large as a few thousand shirts. Custom t-shirt printing is a great medium for marketing your brand, message or cause. Everyone owns custom tees so why not have people wearing your shirt around town? 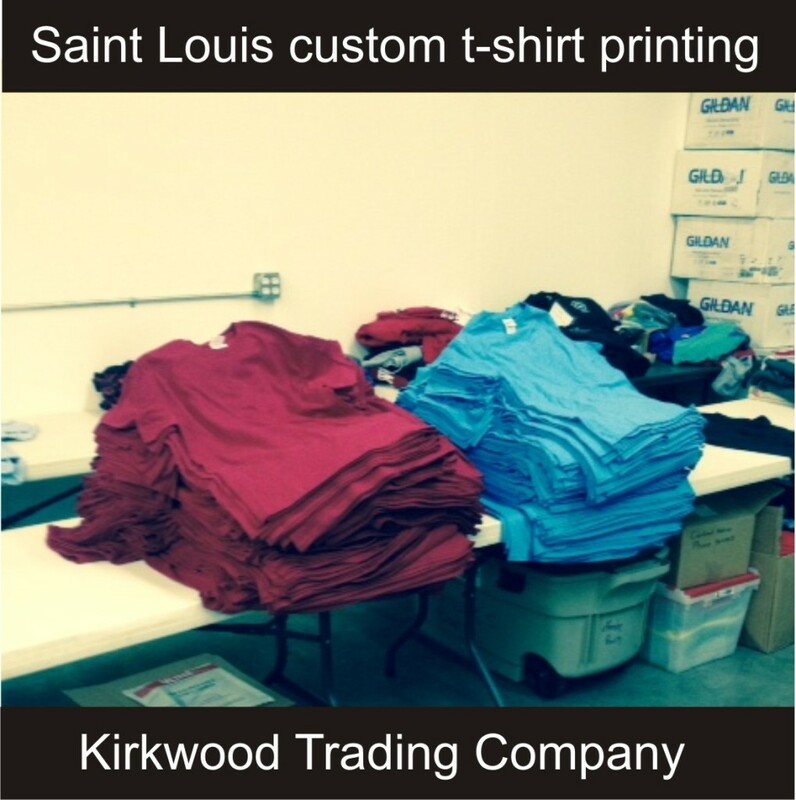 Kirkwood Trading Company has been custom tshirt printing in Saint Louis for over two decades. In that time they have built a business that truly caters to the client. Whether it’s a ball team, fundraiser, or business needing custom t-shirt printing, they have you covered with their full line of apparel, name brand products and hundreds of different style shirts and apparel. While they advertise custom t-shirt printing they provide screen printing on several items including sweatshirts, shorts, hats, bags, jerseys, and more. They proudly serve the entire Saint Louis including the following cities: Kirkwood, Webster Groves, Manchester Mo., Ballwin Missouri, Chesterfield Missouri, Valley Park Missouri, Affton Missouri, Lemay Missouri, Ladue, clayton, Richmond Heights, Dogtown, South City, North City, Maryland Heights, Creve Coeur, Clarkson Valley, Grey Summit, Sunset Hills, Eureka, Fenton, O’Fallon, Saint Charles, St. Peters, Maplewood, Normandy, and every place else.